South Asian immigration grew in the latter half of the twentieth century, spurred by changes to immigration laws in 1965. 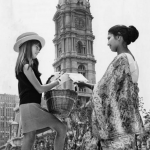 This photograph from 1967 shows “Liberty Bell girl” Kathy Vena (left) offering tourist information to Mrs. K. L. Gupta, a recent immigrant to Philadelphia at the time. She arrived with her husband, an engineer. Philadelphia’s universities drew students from South Asia pursuing advanced degrees. 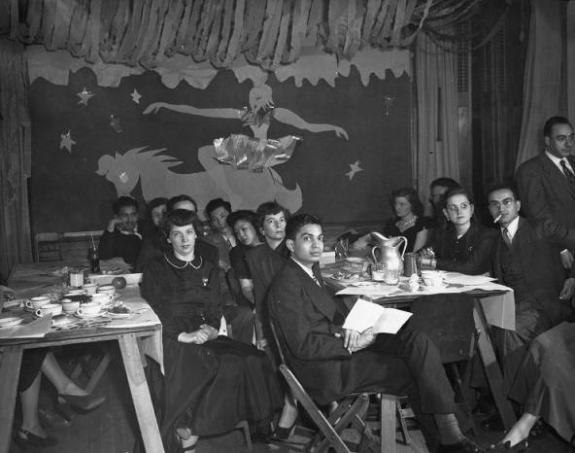 This photograph shows students from Pakistan, India, and other nations dining at the University of Pennsylvania’s International House in 1949. Indians make up one of the most prevalent South Asian ethnicities in the area and are the majority in the small municipality of Millborne, Delaware County. 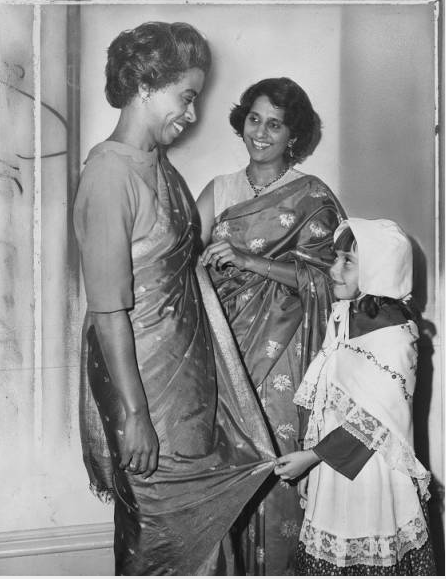 This 1966 photograph shows Indian immigrant Shalini Rayapati demonstrating the traditional Indian sari at the Young Women’s Christian Association’s World Fellowship Festival. Saris consist of a single panel of fabric that can be up to eight meters long and are wrapped and draped around the body. South Asian populations in Delaware County have led to the establishment of several businesses in the area selling traditional clothing, including saris. South Asian immigrants were drawn to Philadelphia in the 1980s by the opening of Limerick Nuclear Power Plant in Montgomery County. The power plant primarily attracted engineers and scientists. 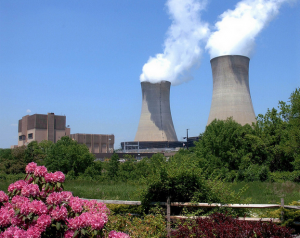 Limerick opened in 1986 after years of protests by anti-nuclear activists. Many South Asian immigrants to Philadelphia eventually settled in the suburbs, where they established cultural and religious institutions to serve their communities. 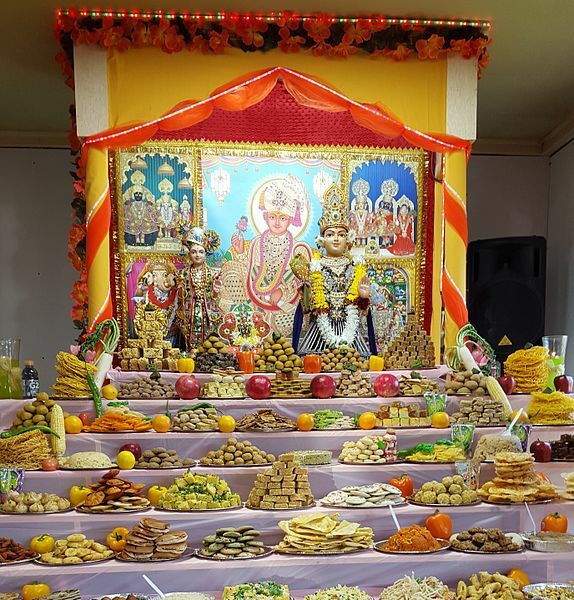 This photograph is from the Hindu Swaminarayan Temple in Telford, Pennsylvania. 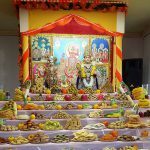 It shows foods prepared for the Diwali holiday, which concludes with a feast of sweets. Most Bhutanese and Nepalese immigrants in Philadelphia arrived after 2010 as refugees forced out of their countries due to their oppression as ethnic minorities. Art from the area arrived much earlier, however. 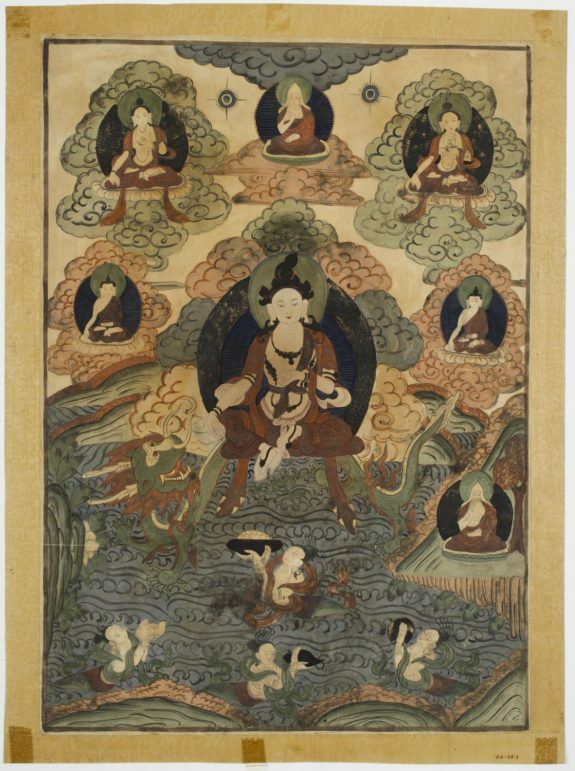 This early twentieth century painting, likely originating in Bhutan, was donated to the Philadelphia Museum of Art in 1940 by an anonymous donor. 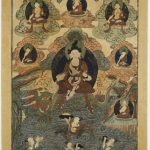 It shows a bodhisattva–a Buddhist individual who has achieved nirvana–riding on a dragon. South Asian migration to Greater Philadelphia arrived in small numbers through the 1800s from the group of seven countries including India, Pakistan, Bangladesh, Nepal, Sri Lanka, the Maldives, and Myanmar. This large region shared a history of British colonization until as late as 1965, and different migration patterns and political histories made community life unique for each group as it settled in America. 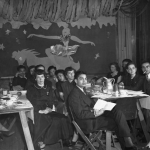 Diverse in their cultural heritage and dispersed throughout the Philadelphia region, as a whole South Asians exemplified the effects of the United States’ new immigration policy after 1965. Migration from the Indian subcontinent to North America was initially spurred by the demand for cheap labor in the late 1800s. Sikh, Hindu, and Muslim men worked along the West Coast states of Washington and California, in jobs in the lumber mills and on farms in the first few years after 1900. 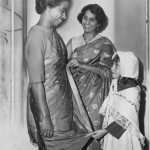 Strictures against women’s immigration, as well as laws barring Asian land ownership and preventing South Asian men from marrying white women made further settlement in the United States very difficult. With the end of colonial rule and changes in immigration laws in 1965, new policies attracted skilled persons who could fill specific technical labor shortages. South Asians, while varied in nationalities, faiths, ethnicities, and language, collectively soon became the fastest growing immigrant group in the United States. While a few individuals may have come to Philadelphia in the 1950s or before, most South Asians arrived after the 1965 Immigration Act. Because immigration laws required specialized skills or advanced academic degrees, these new immigrants arrived equipped with education and English language proficiencies. Most came from India or Pakistan as students pursuing advanced degrees at the University of Pennsylvania, Villanova University, or Temple University. Census reports since 1980, when Asian Indian was first categorized as an ethnic group, revealed a profile of South Asians in the U.S. and in the Philadelphia area as highly educated, professional, and earning above average incomes. Most were married and had children. South Asians did not emigrate as a homogenous group, but rather came at different moments in history, for varied reasons, and from multiple locations. After gaining independence from Pakistan in 1971, migrants from Bangladesh arrived in Philadelphia through the Diversity Lottery, instituted in 1990 by the United States to increase migration from underrepresented countries. Many of these migrants first located in New York City, but soon resettled in Philadelphia where they sought more affordable housing and better educational opportunities for their children. Unlike the other South Asians who chose migration, the Bhutanese and the Nepalese arrived in Philadelphia primarily after 2010, as refugees forced out of their countries due to their oppression as ethnic minorities. Through local resettlement agencies like the Hebrew Immigrant Aid Society and Pennsylvania and the Nationalities Services Center, these communities were able to find housing and employment support to rebuild their lives in Northeast and South Philadelphia, where they were relocated. The multiple avenues for migration determined the range of job opportunities for South Asians in the Philadelphia area. 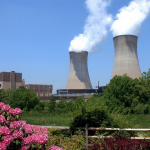 For example, in the late 1960s engineers and scientists arrived to work at the Limerick Nuclear Power Plant in Montgomery County, and physicians, dentists, and pharmacists to work in health care around the region. For those in the health-care field, Philadelphia was an optimal city for relocation due to the research and residency opportunities at university hospitals. In addition, a program at the University of Pennsylvania Dental School offered international dentists a pathway to certification and licensing in the Unites States. However, as the job market began to contract by the late 1990s in the engineering and health-care fields and as additional South Asians arrived through the Diversity Lottery, family reunification, or refugee resettlement, their work diversified to include small businesses, the service industry, and taxi driving. Family life and the connection to cultural heritage remained a critical feature of their lives and their choices of where to locate within the Greater Philadelphia area. Because many South Asian families prioritized the best education for their children, schools and school districts also influenced decisions about where to live. The early immigrants who came before 1980 may have arrived initially in Philadelphia, but they often settled in the outlying suburbs, especially Delaware and Montgomery Counties in Pennsylvania. Later migrants followed the more traditional route of choosing communities according to goals of family reunification and employment networks. Pakistani Christians, for instance, settled in Philadelphia’s Northeast and Bangladeshi Muslims in West Philadelphia. Millbourne Borough, west of Philadelphia in Delaware County had an Asian majority population and became home to Indians, a South India Keralite community, Bangladeshis, and Pakistanis. Religion and the ability to practice their faiths upon their arrival was critically important for many South Asians. In order to maintain religious practice, they built mosques, churches, Hindu temples, and Sikh gurdwaras in Philadelphia and in the suburbs near their homes to worship and maintain close social and religious ties to their countries of origin and to each other. Additionally, these religious organizations often had Saturday or Sunday schools that educated the younger generation in religious practice, culture, and language, further strengthening local community ties. As South Asian Philadelphians established themselves, they began their own ethnic organizations as well. The Council for Indian Organizations was founded in 1983 to, celebrate cultural heritage and encourage members to become more civically engaged. Although separate organizations, both the Bhutanese American Organization, founded in 2013, and the Nepali Cultural Society of Philadelphia, founded in 2010, helped their members not only preserve their cultural heritage but also navigate life in American society with assistance with employment, health care, and English language skills. The Bangladesh Association of Greater Philadelphia observed cultural and traditional events and Moder Patshala focused on the education of Bangladeshi American children working with them on homework and study skills at this nonprofit after-school program. Not only did these organizations host large festivals and gatherings to celebrate and share their culture and heritage with other Philadelphians, many also did advocacy work for their communities in South Asia and in Philadelphia. Money and donations of clothing were often collected to send back, particularly in times of crisis such as the 2012 factory fire in Dhaka, Bangladesh, and the 2010 floods in Pakistan. Just as important, South Asian organizations in Philadelphia worked to ensure employment and educational success and to assist new immigrants in the citizenship process. These South Asian cultural organizations supported active involvement in the city through English language assistance, civic engagement, and voter registration. Diverse in their heritage, customs, and their migration patterns, South Asians in the Philadelphia region owed much to changes in immigration laws for how and where they settled. 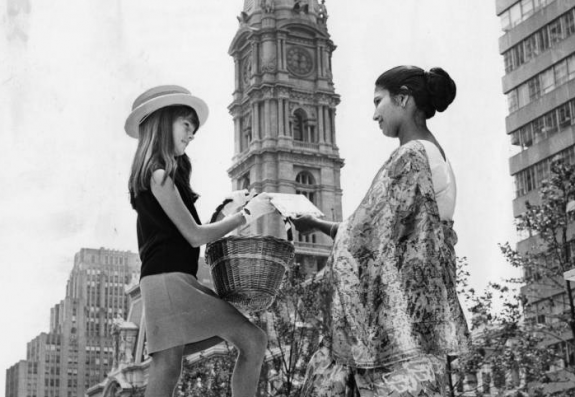 Whether they came as skilled workers after 1965, joined family members in the 1980s, or arrived later as refugees, South Asians shared a strong desire to build their lives in the city as Philadelphians with their distinctive culture, faith, language, and heritage. Asian Americans Advancing Justice. Community of Contrast Report, 2013. Daniels, Roger. History of Indian Immigration to the United States: An Interpretative Essay. New York: The Asia Society, 1989. 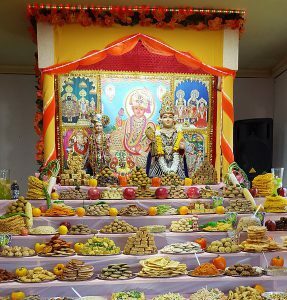 Prasad, Leela. Live Like the Banyan Tree: Images of the Indian American Experience: An Exhibition at The Balch Institute for Ethnic Studies. Philadelphia: Historical Society of Pennsylvania, 1999. SAALT (South Asian Americans Leading Together). A Demographic Snapshot of South Asians in the United States, 2015. Takaki, Ronald. Strangers from A Different Shore. Boston: Little, Brown and Company, 1998. Millbourne Shopping District, Upper Darby Township, Pa.